I have extremely strong feelings about this book – not all of them good ones – so forgive me if this turns into a rant. Forgive me if I’m mistaken, but under normal circumstances I would take these achievements as a warning that the novel should be the most incredibly badass, phenomenally written piece of perfection on the planet. Combined with the blurb on the back, which reads, “Enter a village imprisoned by its fear of the unknown. Where curiosity is discouraged, and no one has ever left – or wanted to. Until now,” I expected something as good as ‘The Hunger Games’, or even better. Not to mention that my parents read Baldacci’s novels almost religiously, so when they saw he’d written a teen fiction, they practically threw the book at me and told me I had to read it. Given that I’ve rewarded ‘The Finisher’ with two stars rather than five, I’m sure you’ve guessed that it did not measure up to my high expectations. If the intention of the bright red page was to make me doubt my – now extremely low – opinion of the book, it failed. I’ll start off with the things I found right with ‘The Finisher’. There are only two, really – one for each star I awarded the book. The first is that I cannot deny that Baldacci writes action-filled fight scenes very well. The action in ‘The Finisher’ might just be enough for Hollywood to churn out yet another movie with Baldacci’s name flashing for a second or two at the end, though perhaps this time there will be no Clint Eastwood to draw in a semblance of an audience. The second good thing I could find in the story was Baldacci’s decision to have a female protagonist, who single-handedly defeated just about every single male antagonist that she came into contact with. Although, now that I think of it, his feminist approach to the story might just have been a way to gain respect from female teen readers. This brings me onto my next point. I hated the way that ‘The Finisher’ was written. The protagonist, Vega Jane, was a girl with whom I was totally unable to relate. As I have said over and over again in many of my other reviews, this can absolutely destroy a story’s chance at success. All realistic and likeable characters have something to which the reader can relate. Furthermore, the storyline itself was disjointed and random. The perfect comparison for the storyline is of a feverish dream, where everything may make sense to the person dreaming it (in this case Baldacci) but when he wakes up and tells it to others (perhaps the readers), they realize that the dream made no sense at all, and the images that may have seemed bright and exciting in the dream-world were actually just the jumbled confusion of a crazed mind. To conclude, I was disappointed with Baldacci’s work. 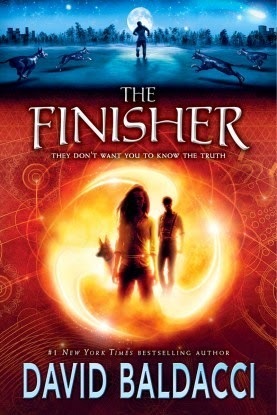 ‘The Finisher’ had so, so much potential to be a phenomenal read, but it was sloppy and annoying. Perhaps it is better suited to younger readers who are not so consumed by the necessity of beautiful writing, and desire action over quality.